For those unfamiliar with the band, Weedeater is essentially the spawn of the defunct coastal North Carolina sludge mongers Buzzov•en. Manifested by vocalist/bassist "Dixie" Dave Collins in 1998 after the Buzzov•en split, Weedeater has steadily carved out a place among stoner circles for their reverb-laden riffs and bottom-end groove. It's been four years since the trio (Dave, Keith Kirkum behind the kit and Dave Shepherd on guitar) last released an album, heightening anticipation within their fanbase for 2011's Jason... The Dragon. The new album is prototypical Weedeater and deviates only slightly from the overall fuzzed-out style the band's genre is known for. The guys do a fine job of varying the pace, however, alternating between ponderous tracks like "Hammerhandle" and those with a bit more of a trotting groove to them - "Mancoon", for instance. The upliftingly groovy riffs on "Homecoming" are catchy as hell and, combined with Collins' grumbling bass, make this track really stand out as the best the album has to offer. Kirkum is a bit more energetic on this track as well, skillfully flailing away at the crash cymbals as he lays down a fine beat pattern. Kirkum also shines on "March of the Bipolar Bear", a short track that is essentially just a drum solo. Collin's vocals are still of the raspy, croaking style which distinguishes Weedeater from their peers. While some may find his delivery distracting, I think it adds character. 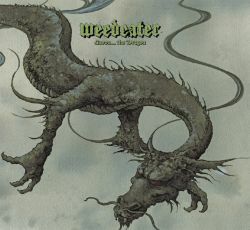 The two tracks where Weedeater ventures far beyond the typical stoner comfort zone are "Palms of Opium" and "Whiskey Creek". The former features a plucky, soulful bass line that, together with a rather Appalachian guitar melody, does well to capture the humid, sluggish pace of the Carolina lowlands. Collin's vocals are coated in effects that are oddly contagious as they enhance that familiar Southern drawl. "Whiskey Creek" is an instrumental banjo piece set to the backdrop of rainwater splashing on what I assume to be a covered porch, again evoking Southern imagery - this time of a verdant Appalachian holler. A little more than two-and-a-half minutes into the song, there's a moment of silence followed by a bluesy piano performance. Somewhat of an odd end to Jason..., but the contrast with the overall sound of the album isn't as jarring as you'd expect. In short, it works. Jason... The Dragon definitely avoids becoming monotonous yet it never ventures beyond a slow jog, so there are no sudden jolts to contend with. Even considering the minuscule runtime of just over 34 minutes, stoner and sludge fans will eat this one up while those curious about the genre should find Jason... to be an adequate gateway album.